It was some kind of serendipity that I happened to have this music from the experimental classical, electronic, lounge, folk Echo Park-based Brendan Eder Ensemble sitting in my inbox. 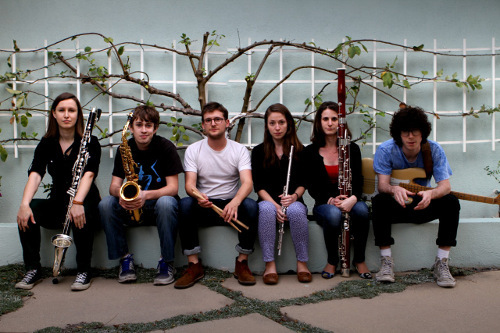 It has just been announced that they’ll be adding their delightful woodwinds to music from fellow Eastside L.A. band Haunted Summer at The Troudadour on January 6. Yeah, it’s a ways off, but it’s a special show that will also feature So Many Wizards and Summer Twins. Brendan Eder is a composer and producer, creating film scores and leading this ensemble that blends many different genres and styles. Their debut recording is expansive in range, moving from crisp classical sounds with a driving jazzy and at times hip-hop beats to a personal favorite of mine, the fluttering and glittering romantic vibe of “Pastorale.” From there, it gets even more exotic with the appropriately titled “Panther,” which sounds like a sleek romp through a beckoning jungle. “Start” is far more experimental, while “Vamp” is not surprisingly seductive with its ear-tickling percussive bits and hand claps. “Vulnerability” is deliciously complex, and the recording closes with a gorgeous piece called “Cache.” Floating in time and space with meandering clarinet, it very much feels like Shavasana after a particularly rigorous Vinyasa Flow session. The ensemble features Henry Soloman on alto sax, Andrew Leonard on clarinets, Sarah Robinson on flute, Paul Curtis on bassoon and Sam Wilkes on bass.